Hypothesis: Glengarry Glen Ross is a minimalist film that utilizes character exploitation to drive desperate actions by the supporting cast to create a memorable and honest film. This film loves (well-written) monologues. The film exploits every ounce of desperation from its characters. Glengarry Glen Ross isn't rich in set pieces or special effects. But the props don't interfere with the meaty dialogue that does more than enough to make up for the lacking props, by gasconading testosterone-fueled bravado and discourse over intensity and desperation. The under-performing salesman are presented with a stipulation: either sell, or be fired. After the salesmen learn that the one who sells the least by the end of the week will be fired, the entire staff is launched in an uproar of defense and panic. Some try to sell, others think of alternative solutions; stealing the good leads from the office in the middle of the night. The next morning then becomes a who-dun-it mystery, as the sales staff is forced to defend themselves against the interrogation from the police. And what really propels the desperation, is each salesman trying to sell their own defense of their innocence against the others. And just as natural salesmen do, these characters all recite detailed, verbose, and volatile monologues, reinforcing the only trait that this subset of working class has. 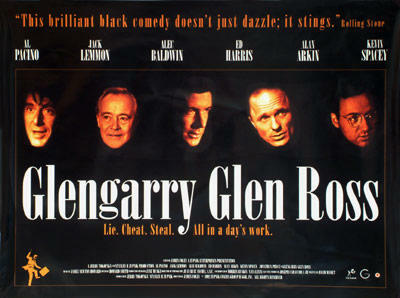 Glengary Glen Ross isn't trying to preach minimalist ideals (suggested by the natural inclination of a salesman). But the film's lacking special effects, CGI, or expensive set pieces create a very singlular scene that takes place almost entirely in an office. And although this sounds like an unlikely environment for a film, the scrip writers put all of their chops and bravado into the script, that maximizes the quality actors used for the film (Kevin Spacey, Alec Baldwin, Al Pacino, Ed Harris). Glengary Glen Ross strips filmmaking to its core, and puts its emphasis into its script, injecting so much power and strength that the lacking set practically has zero influence on the picture. There's a good chance the film could have been filmed in a remote location, and still offered the same impactful delivery due to the magnitude of its script. Although the film doesn't offer much to chew on, what is there is alot to swallow. And all that it offers is presented in an honest disposition that makes Glengary Glen Ross a film containing literary merit. The desperation fulfills the bulk of the honesty, as the desperate actions are believeable because of what is on the line for the salesmen.